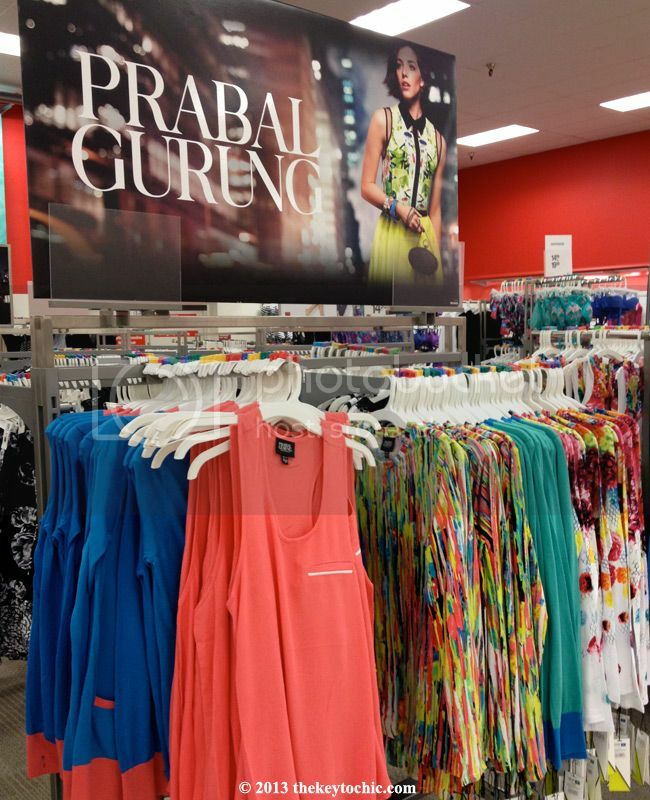 As an avid fan of both Prabal Gurung's feminine dresses and eye-catching prints, I was eager to wake up early this morning and shop the Prabal Gurung for Target collection, try on some pieces in the fitting room, and share my thoughts in this review. Fortunately, there was only one other shopper at Target's doors eagerly awaiting the 8am store opening, and unfortunately, we wore the same size in both clothing and footwear. 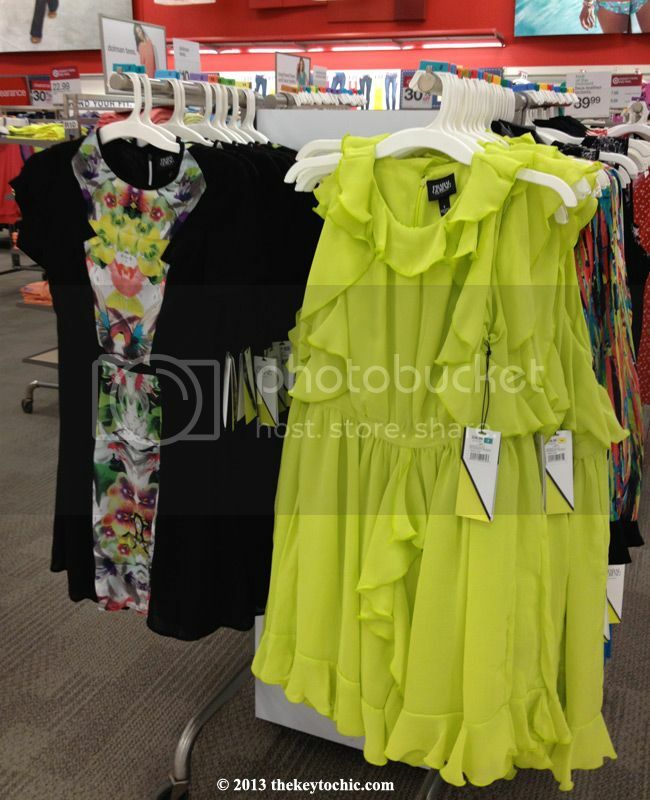 The store carried almost all the clothing, except for the pleated skirt in yellow, the leather jacket, and the red ruffled dress. 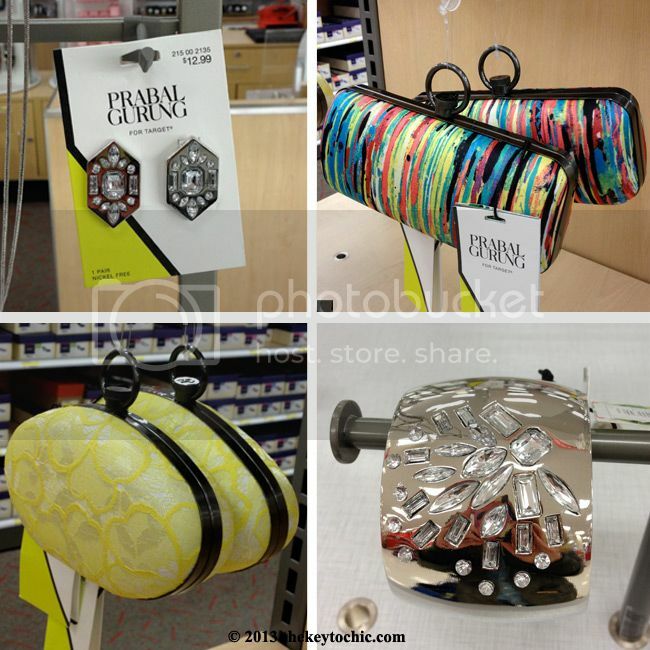 You may have seen my photos and videos if you follow me on Twitter, Instagram or Vine (@thekeytochic). 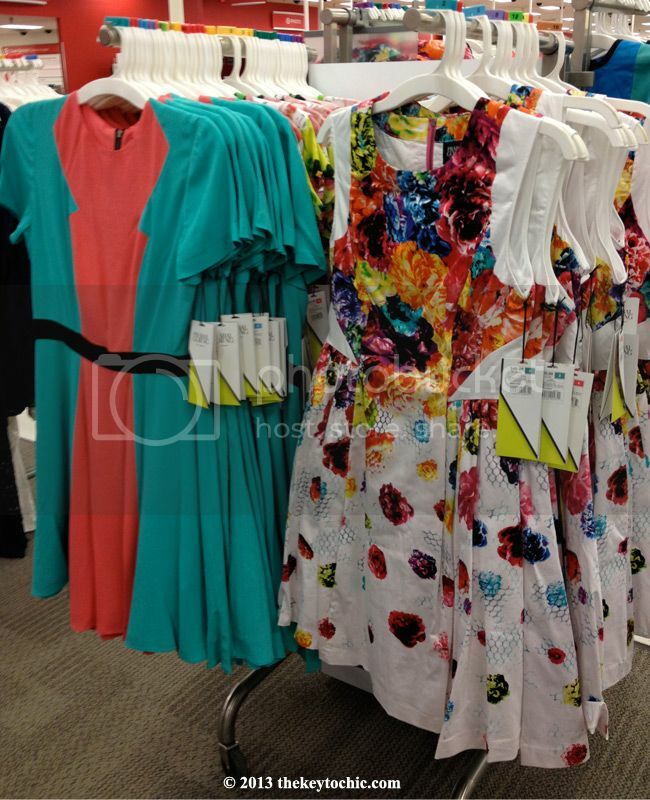 Here's what the collection looked like as I approached the perfectly merchandised racks. 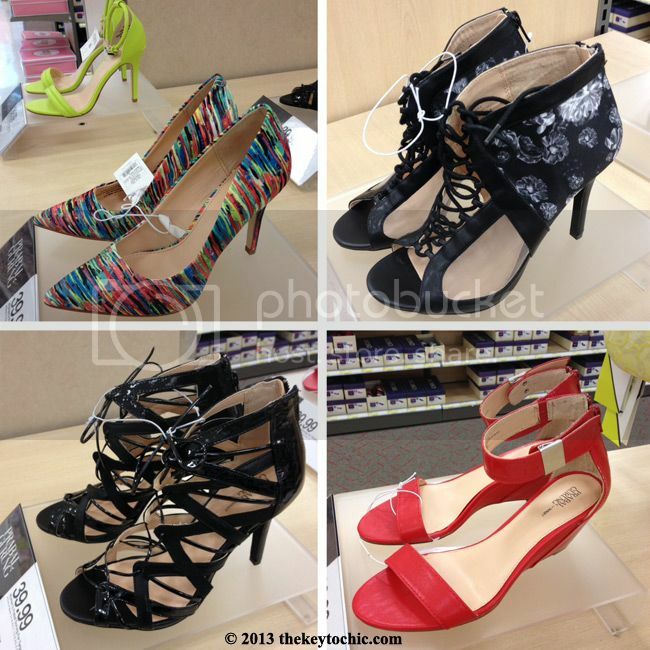 Shopping tip: all of the heels and wedges that I tried on ran one full size big, so size down! The heels are pretty comfortable, and the lace-up ones are really easy to walk in due to the adjustable ankle support. The lace-up styles also have a back zip which can be tricky at times. The ankle strap heels are slightly less comfortable and have a pull-through style strap which looks really sporty in person. 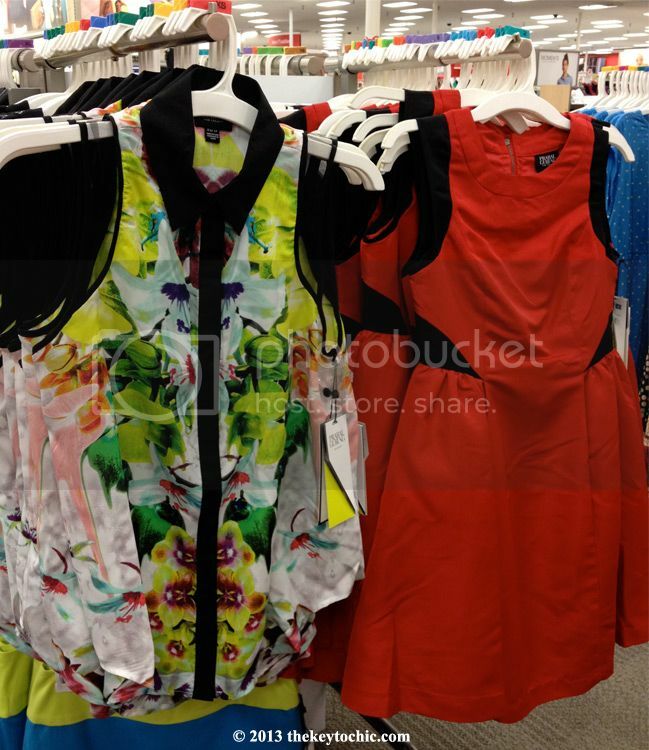 I narrowed down my selection of favorites and headed to the empty fitting rooms for a closer look. 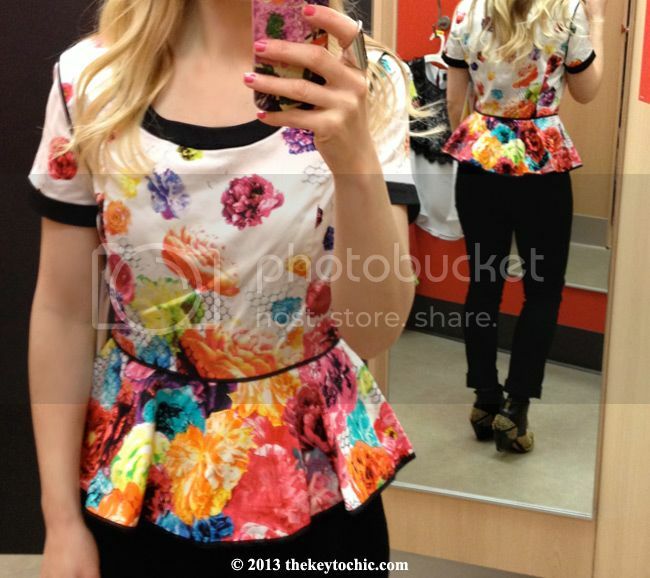 First up, the peplum top in Floral Crush print runs true to size, has a side zip, and was comfortable. I am wearing a size 4 and I found the waist-defining silhouette to be both flattering and irresistible, not to mention the ultra feminine floral print. 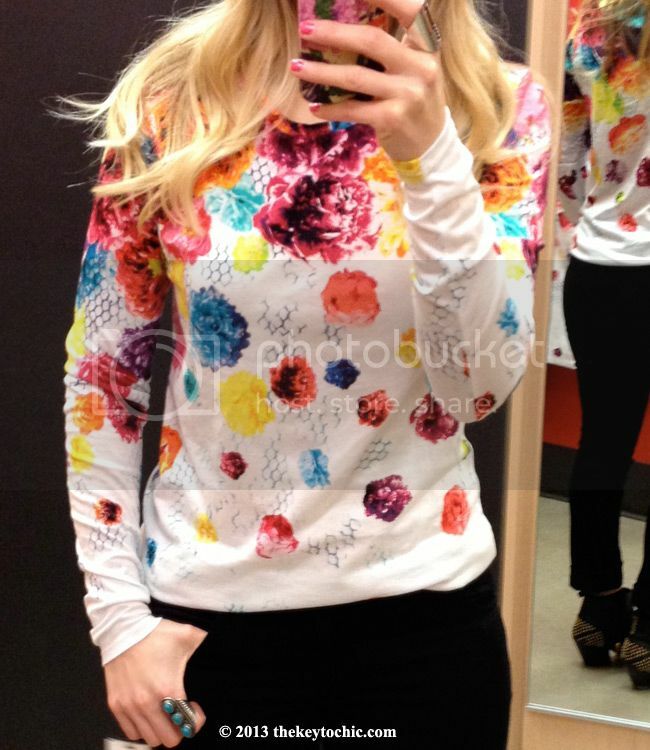 The Floral Crush long-sleeved tee was a surprise hit. I avoided ordering it online because I wanted to check the fabric in person. It runs big (with a generous length) and I'm wearing a small tucked into my jeans. The cotton/modal blend is soft and lightweight, and ideal for layering until the weather warms up. 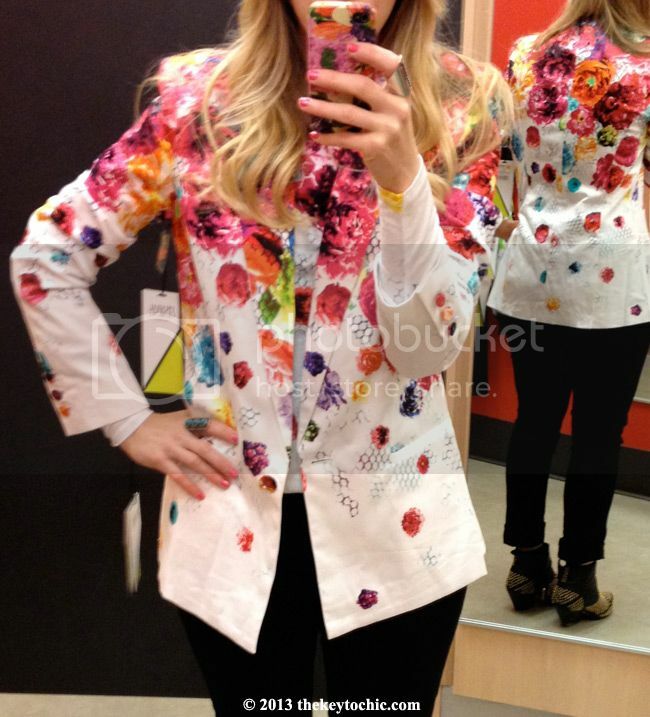 One of my most anticipated pieces was the blazer in Floral Crush. I'm wearing a small. The sleeves were a bit long because I'm petite, and the waist had more than enough room when buttoned. The fabric was lighter than expected, and I'll wear it with the sleeves pushed up for a casual feel. For winter, I'll wear it over a sweater/turtleneck, and with a tank top underneath for spring/summer. 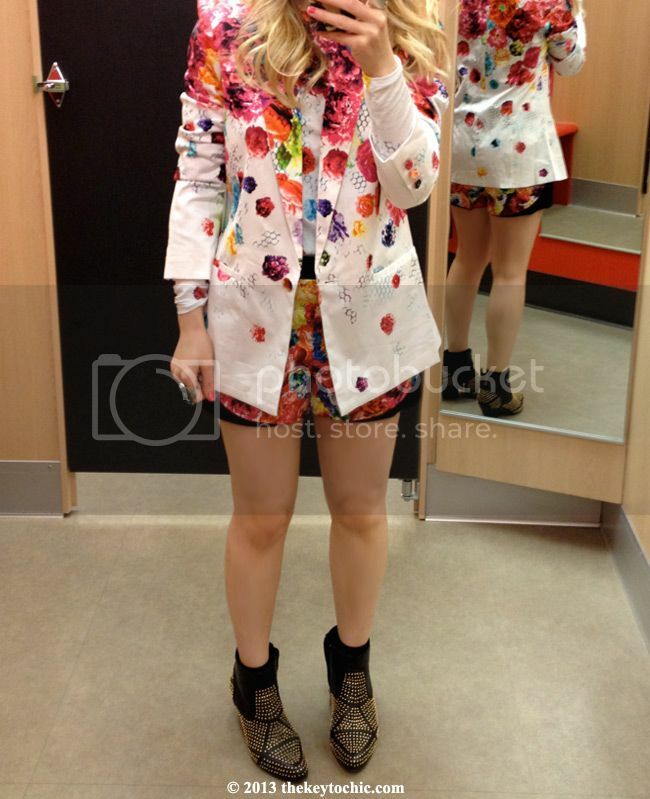 Here are the Floral Crush shorts along with the blazer and long-sleeved T-shirt. I sized up with the shorts (the other shopper grabbed a size 4, so I got a 6). They have on-seam pockets and a black contrast waistband. Since they are lightweight, I'll wear the shorts with black tights and ankle boots for now, and bare legs/sandals for summer. I advise sizing up if you have hips or are curvy, or going with your regular Target size if you are narrow in the hips or less curvy. 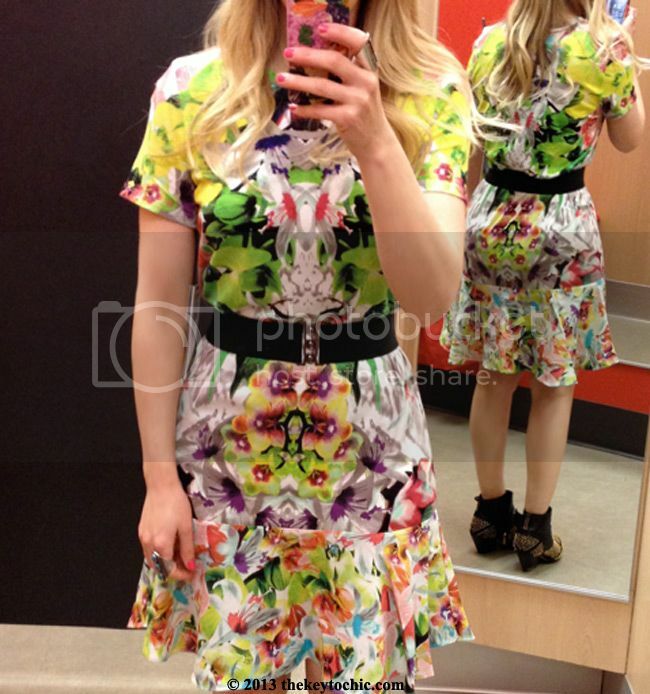 The pullover drop waist dress in First date print looked hard to pull off on the hanger, and I was right. 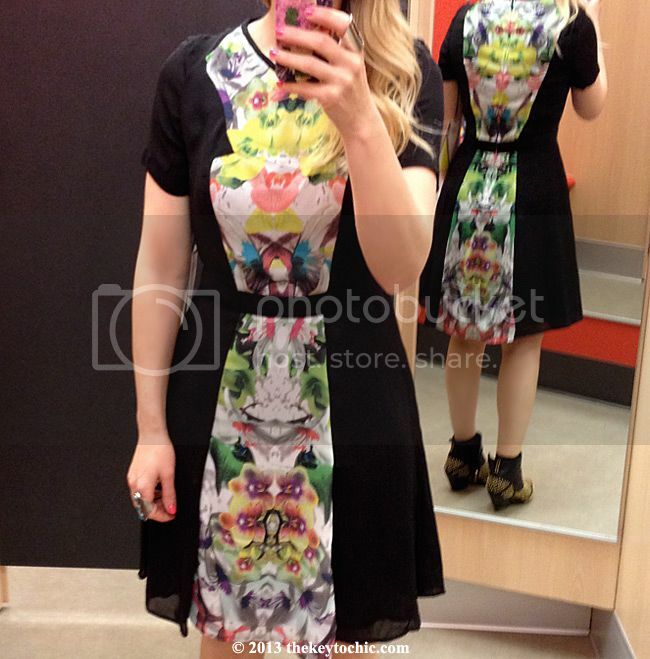 The print can accentuate curves, and its trumpet hem draws attention to the hips and thighs. The fabric is soft and lightweight, but not so lightweight or sheer that you'd need to layer a slip underneath. It runs true to size, and I'm wearing a size small with my own stretchy belt to define the waist. 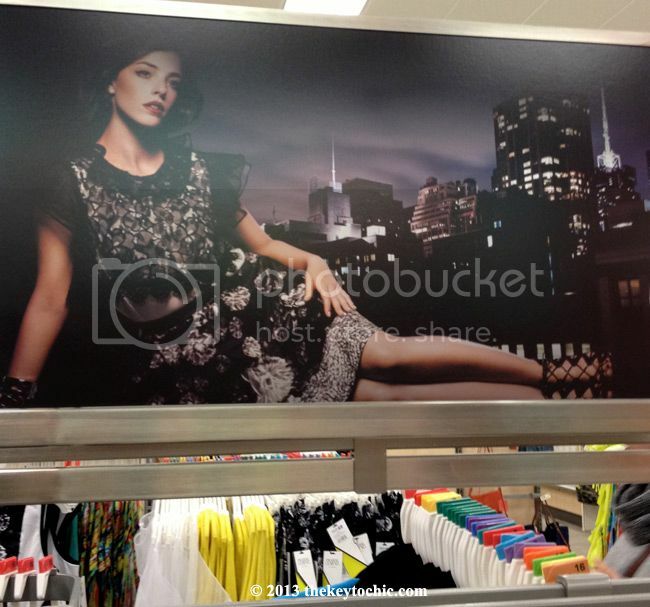 The sleeveless blouse in First Date print runs big. I'm wearing a small, and found it to have large armholes and plenty of room in the hips. It's a piece I might wear tucked into a skirt or jeans for a more polished look, or untucked under a moto jacket for a relaxed and casual look. The fabric is a very soft and silky polyester with a somewhat tricky button-front placket. The black panel dress in First Date print ran a little small in the waist and chest, and had a flattering tailored waistband. I was pleasantly surprised by the printed panel in back, as I was expecting it to be solid black. I'm wearing a size 4, and I recommend sizing up on this one. The polyester fabric is more dressy than the other pieces I tried on, making it a more elegant option and giving it a more expensive feel than its $39.99 price tag. Lastly, there's my favorite piece in the collection. It's casual, comfortable, and fun. The sweatshirt in First Date print is the piece that I'll get the most use out of. It fits my casual and active lifestyle, and works just as well with skirts and heels as it does with jeans and ankle boots. I'm wearing a small, and it runs true to size. The cotton/polyester blend fabric gives it some structure while also keeping it soft, and the black ribbed trim makes it somewhat sporty. No surprise that it's selling out quickly online.